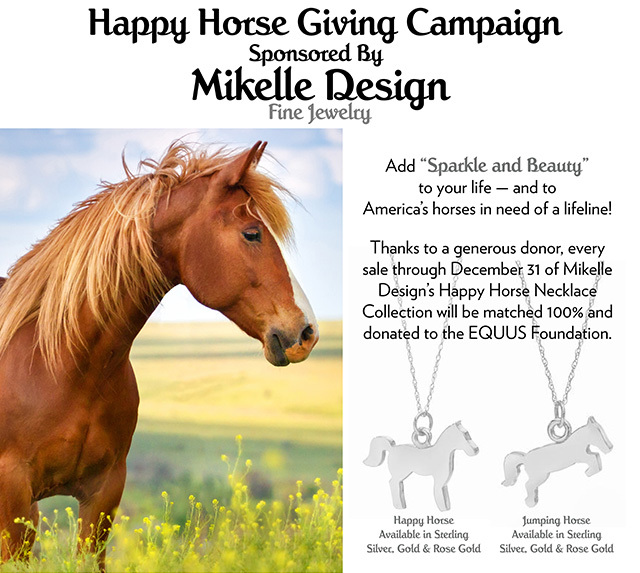 The EQUUS Foundation is thrilled to be partnering with Mikelle Design for our Happy Horse Giving Campaign. All horses, even champions of the racetrack and the show ring, are only one unlucky sale away from abuse, neglect and being shipped off to slaughter. Too many of America's horses are in need of a lifeline and opportunities to thrive. Tens of thousands were shipped across our borders to be slaughtered last year — most were young, healthy and had untapped potential. Instead, they could be sharing their magic and power with people. • Making the unique abilities of horses to empower, teach and heal available to more people. Today, the benefits of the horse-human bond have never been more apparent. Horses thrill us as athletes, but they are also amazing teachers, companions and healers. Yet, while there are an estimated 48.9 million people with disabilities (one in five Americans), only 66,000 people currently benefit from equine assisted learning and therapies (EAAT), and only an estimated 7,800 horses are serving the special needs community. With your help, many more horses can be assisting people with and without special needs. Learn more about us here. and comfort to America's horses in need of a lifeline.